BTC City Ljubljana cycling team ready to race in historic women’s WorldTour • BTC d.d. WorldTour, which is organised on the same basis as the men’s version of this series, comprises 35 racing days across 9 countries. In this time, the cyclists will race in 4 stage and 13 one-day races, with the conclusion of the WorldTour taking place in the scope of the Spanish race La Madrid Challenge by La Vuelta. By introducing the women’s WorldTour, the International Cycling Union (UCI) has made another step forward in the development of women’s cycling. Women’s WorldTour will see its premiere this year and will replace the long-existing World Cup, which premiered way back in 1998. Besides a higher number of races, UCI also decided on the intensive promotion of women’s cycling in media. The organisers of every race will need to ensure coverage of the event, either TV coverage, coverage on the web or a collage of best moments right after the conclusion of the race. 8 live coverage sessions are planned. During the WorldTour’s entire season, current news and information will be posted on social media networks. In the first race – Strade Bianche, starting and finishing in the Italian city of Siena, the BTC City Ljubljana team will be represented among the world’s elite by Polona Batagelj, Mia Radotić, Jelena Erić, Anna Plichta, Urša Pintar, and Eugenia Bujak. The latter will arrive in Italy directly from the UCI World Track Championships in London, where she and the Polish national team are currently trying to qualify for the Summer Olympic Games in Rio de Janeiro. The race, the name of which translates to “white roads”, will take place in the marvellous Italian region of Tuscany. The cyclists will take on 120 km in length and 2,000 metres in altitude. This race is especially interesting and demanding due to 22 km of the race taking place on macadam roads, where some sections reach a slope of even more than 20 per cent. On these so-called “white sectors”, the cyclists will have to show their courage, endurance, and abilities. The longest white sector is 9.5 km long and will most probably significantly shorten the peloton. Among the loyal supporters of the team is also the BTC Company, a co-founder of the BTC City Ljubljana team and a long-time supporter of cycling in Slovenia. 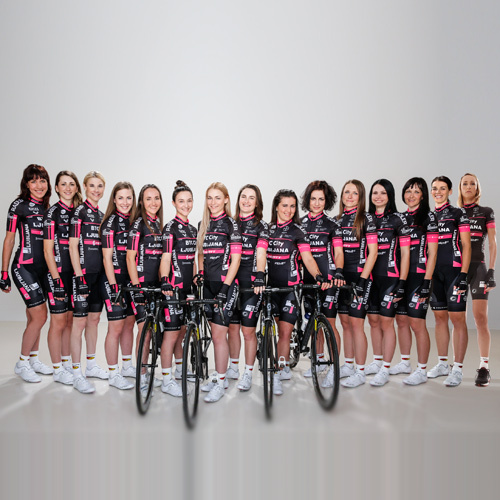 Together with the girls who are pushing the limits of women’s professional cycling in Slovenia as well as abroad we are looking forward to the upcoming races and have no doubt that they will continue with their success stories in this season, already their third one on professional circuit.